What's Sending Shares of Bed Bath & Beyond 6% Lower Thursday? 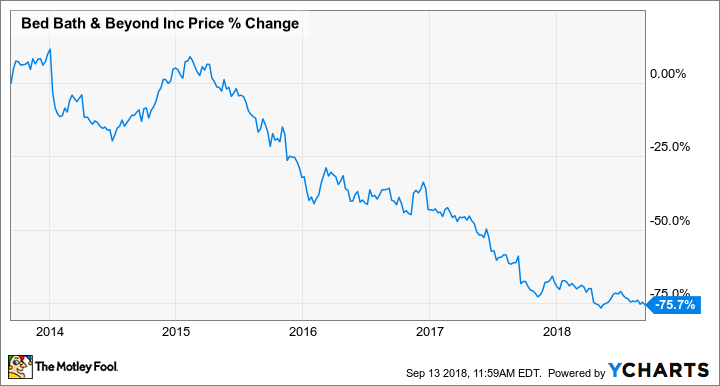 Bed Bath & Beyond shares are down 6% Thursday and have shed 75% of their value over the past five years as a business turnaround seems increasingly difficult. Shares of Bed Bath & Beyond Inc. (NASDAQ:BBBY), a home furnishings retailer with products including bed and bath accessories, kitchen textiles, cooking supplies, and more, are down more than 6% as of 12:09 PM EDT as investors digest the news of potential store closings and a business turnaround that remains elusive. Bed Bath & Beyond said it would close the doors on two Long Island stores as soon as this fall if it couldn't negotiate new and more favorable building leases. Management had already said as many as 40 stores could close by the end of fiscal 2018 if leases weren't more favorable for the struggling retailer. "As we recreate the foundational structure of our company over the next several years, our stores remain a critical part of the equation to achieving our growth objectives. We remain focused on optimizing our real estate portfolio, including the potential closing of stores and/or the sale of real estate assets, along with the opening of some new stores," said Bed Bath & Beyond spokeswoman Jessica Joyce, according to Newsday. The store closings are a reminder of the uphill battle the company and its investors face: the first-quarter was the 10th consecutive quarter of falling same-store sales. Making matters worse, competition could heat up with The Home Depot (NYSE:HD) completing its acquisition of direct-to-consumer home furnishings retailer The Company Store. Home Depot's acquisition could create a strong e-commerce competitor to Bed Bath & Beyond at a time the latter is trying to offset brick-and-mortar sales declines with its own e-commerce business. The reminder of store closings was enough to send the stock 6% lower as investors struggle to see a path forward amid plunging profits, declining same-store sales, and increasing e-commerce competition.